The latest combined heat and power (CHP) technology from Veolia will power the first NHS high energy Proton Beam Therapy Centre for specialist cancer centre, The Christie in Manchester. Due to start treating oncology patients in 2018, the new centre will be one of only two high energy NHS proton beam therapy facilities in the UK. 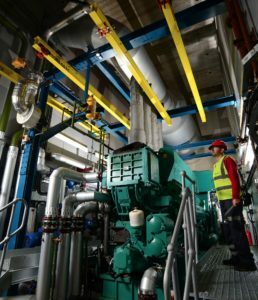 By using cogeneration for its essential electricity and heating needs, the hospital will further reduce its carbon emissions and gain from cost savings that can be redirected to patient care. The Christie has achieved world firsts in research throughout its 100 year history and provides leading diagnosis and treatment to over 44,000 patients each year. To support the proton beam therapy patient care, the new CHP will deliver secure on-site generation of 2,100GWh of electricity and 3,200GWh of heat each year and will save around 380 tonnes of CO2 emissions. Part of the new packaged CHP range from Veolia, the 240kWe unit uses a three-way catalyst to reduce NOx emissions and protect local air quality. The new CHP will further contribute to the carbon reductions delivered by Veolia to The Christie since 2004, where the global resource management company has achieved carbon reductions of 48,000 tonnes. Delivering energy management to hospitals since 1938, Veolia currently provides energy management to over 100 hospitals in the UK and recently expanded its energy performance capability through the acquisition of Cynergin, the leading energy services company and Energy Performance Contract (EPC) specialist. Veolia now delivers energy services which support the healthcare for around 7.9million patients each year and increases sustainability of the sector by annually saving 119,000 tonnes of CO2 emissions.